Remember the last time Honda made a sporty hatchback that didn’t cost a bomb? The Brio could have been it when it was launched in 2011, but it was never officially given the sporty show or go. At best, the Brio was a spacious city hatchback with a peppy engine that needed to be driven hard to have some fun. 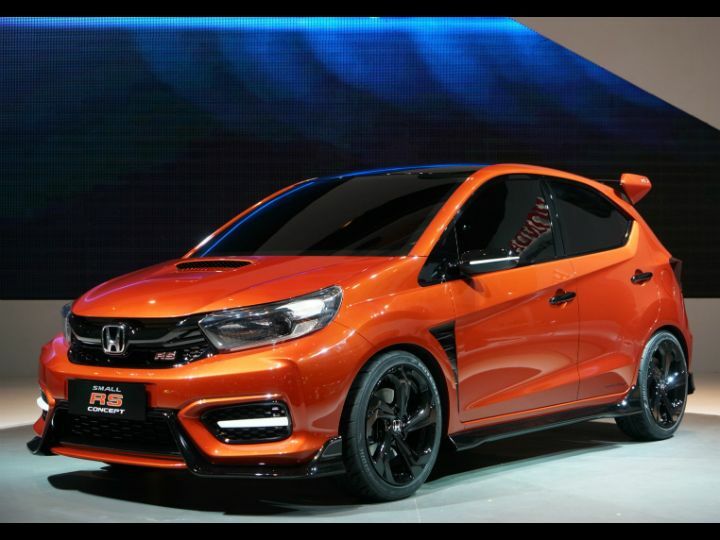 But now, Honda has unveiled the ‘Small RS Concept’ at the Indonesia International Motor Show 2018 and it previews what could be the sporty hatch many had craved for in the first place. For now, the specifications of the Honda Small RS Concept have not been revealed, with only statements from Honda officials claiming that it will be sporty. It does look the part, for sure. At the front, the Small RS Concept has a sportier and more pleasing version of the upcoming Amaze sedan’s face. Highlights here include headlamps similar to the WR-V, a sportier version of Honda’s new grille design, large faux intakes on the bumper intersected by DRLs, a prominent front lip with blacked-out turning vanes and a hood scoop. The side profile is as dynamic as the rest of the Small RS Concept, with faux side vents on the front fender, large black alloy wheels, glossy black side skirts and a sporty window line which ends with a sharp kink at the rear. The rear angle of the Honda Small RS Concept seems like it has taken inspiration from the Ford Figo hatchback and the Tata Tiago. The big wing is unmissable, and so are the two silver dual exhausts. If this does go on to become the all-new Brio, it will replace one unique feature of its predecessor - the all-glass tailgate. Honda has not revealed the interior of the concept yet, but we expect it to be similar to the one on the upcoming Amaze, albeit with sporty touches all around. Engine and transmission options have also not been revealed yet, but we expect the same or updated version of the Brio’s 1.2-litre petrol engine to find a place under the RS’ hood. The Small RS Concept is expected to spawn into the all-new Brio in the coming months and will be launched in Indonesia soon after its reveal. Honda India may take a while to bring the new Brio to India, though. Primarily because of how cutthroat the hatchback segment in India is and also because the company has already set its goal to launch the new Amaze, Civic and the CR-V in the Indian market this year.